Pen-and-ink and wash plan by James Best (fl. 1804) of the basement storey of New Government House at Calcutta in West Bengal, dated c. 1804. 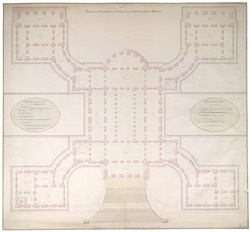 The image is inscribed on the front in ink: 'Plan of the Basement Story of the New Government House. Drawn by Jas Best'; and with the number '30.' This image shows the ground floor of the building with its large exterior ceremonial staircase on the north side. Normally this type of staircase is situated inside an English country house but here it is outside and the ground floor is entered through a porch hidden beneath it. There was also a special dining hall on the ground floor for use in the hot weather. This, together with a number of other modifications due to the hot climate of Calcutta, including the changes to the building's four wings, mark the differences between this structure and the model upon which it was based, Kedleston Hall in Derbyshire. Marquess Wellesley became Governor-General of Calcutta in 1798 and decided that the existing Government House was not a suitable building for his position and needs. He commissioned Captain Charles Wyatt of the Engineers, to be the architect of his new Government House. Four large ceremonial gateways marked each end of the carriageways on the north and south facades, which were partly based on Adam's archways at Syon House in Middlesex.